It took me a while to piece together a page on the airships of Alberto Santos-Dumont. No only are there plenty of 100 year old photos to review and potentially identify, but the historical record is voluminous, much of which contains journalistic misinformation and that slowed my research. Santos-Dumont's own 1904 biography is full of errors! This page is current result of my research about the Santos-Dumont airships and recovering some interesting sites where Santo-Dumont's airships were seen. But I will make note here of the sad end to Alberto Santos-Dumont's life. In 1910, after more than a decade of building dirigibles and heavier-than-air airplanes, Alberto Santos-Dumont "retired" at age 36. He spent the next 26 years of his life apparently suffering from multiple sclerosis and watching his inventions be morphed into a tool of war. Alberto Santos-Dumont, sadly, ended his own life on July 23, 1932 by hanging himself at the age of 59. May he rest in peace. He is buried in Rio De Janeiro, Brazil. Santos-Dumont built no fewer than 20 aircraft, 15 of which were airships. (Four were heavier-than-air aircraft and 1 was a flying boat!) He did not begin to transition from airships to heavier-than-air until sometime in 1905, only about 4 years before he "retired" after an accident in one of his heavier-than-air machines, but he had spent almost a decade experimenting in lighter-than-air, so there are many Santos-Dumont airships to identify! In the section which follows, I will try to illustrate each one. Before I begin I must point out two things. 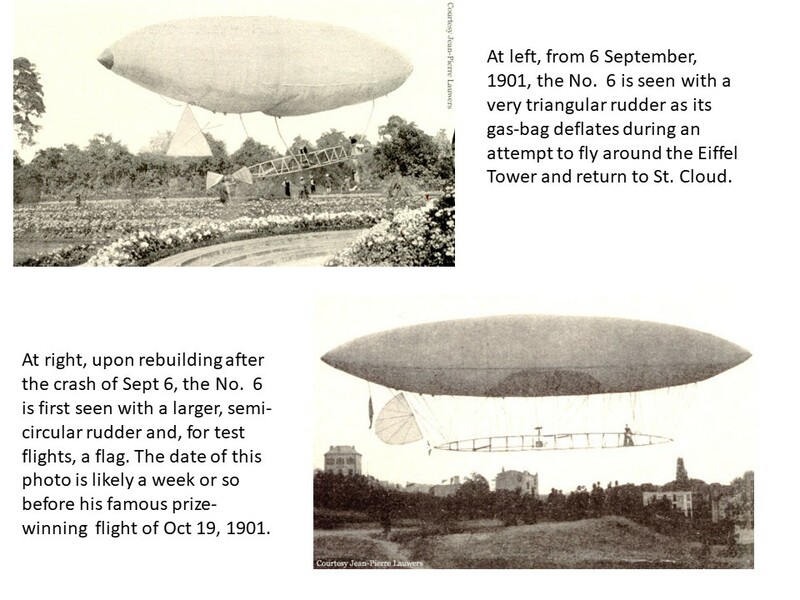 First is that many photos of the era, especially post cards, have misidentified Santos-Dumont airships. Especially prevalent is the "No. 5" being mistaken for the "No. 6". Santos-Dumont himself observed this problem. He said in his 1904 book, "My Airships", on page 133: "This was my 'No. 4,' finished 1st August 1900, and by far the most familiar to the world at large of all my air-ships. This is due to the fact that when I won the Deutsch prize, nearly eighteen months later and in quite a different construction, the newspapers of the world came out with old cuts of this 'No. 4,' which they had kept on file." So Santos-Dumont was well aware of the misidentification of his airships by the popular press. But Santos-Dumont's book did not provide any relief! In fact, it further muddied the waters for the book itself has several illustrations mislabeled. For example, on page 195 the illustration is identified as the "No. 6", while it is in fact the "No. 5" (the airship pictured has no radiator and the location of the pilot's basket is in the 4th "cell" of the keel, not the 3rd). As a second example, on page 215, the illustration is identified as the No. 9, while it is clearly the No. 6! As a 3rd example, on page 267 the No. 14 is identified as the "No. 5."! There are other mislabeled illustrations in the book as well, but I've made my point. These photo identification issues led to many hours of painstaking work to finally determine the visual features of each Santos-Dumont airship and to sort them out. Built in 1898, the No. 1 flew on the 18th of September of that year. Believe it or not, looking at the figure below, the No. 1 had a gasoline engine and a pusher propeller! It survived only two flights. Following instructions from the "experts" present at the inaugural flight, those "professionals" who had experience in launching spherical balloons, Santos-Dumont launched at the upwind edge of the open space, and as he expected, his propeller-driven craft was quickly driven into the trees before it had time to ascend above them. So the first flight ended in somewhat of a failure except that it served to prove to Santos-Dumont that he was right that his airship would be able to move against the wind. Two days later, after repairs to the airship, Santos-Dumont tried again, this time launching against the wind, and ascending to around 1300 feet altitude. After proving to himself that he could navigate, he began a descent. Unfortunately, upon descending, the declining hydrogen pressure in the envelope caused the envelope to begin to fold. His air pump, designed to fill a ballonet to compensate for loss of hydrogen pressure, did not have enough power to provided the needed compensation and the elongated gas-bag folded as the enclosed hydrogen gas changed volume, as the outside air temperature varied. Thus the 2nd flight resulted in a crash significant enough that the No. 1 never flew again. 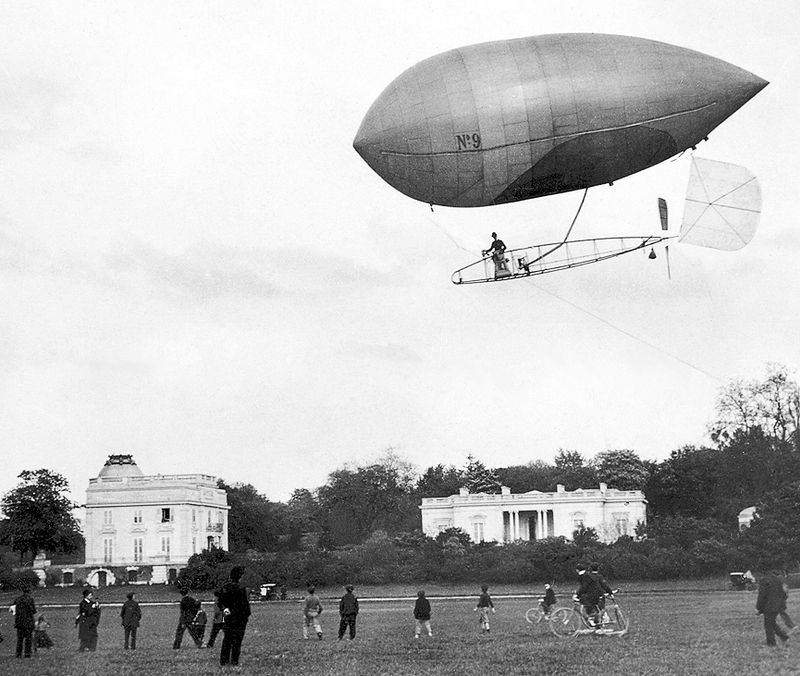 Santos-Dumont was unhurt as he skillfully directed some ground observers to grab a rope and pull the No. 1 into the wind to slow its descent. That worked. Unfortunately, the No. 1 never flew again. Visual: Elongated tube with pointed ends, gondola suspended from cables. No keel as found in later Santos-Dumont airships. There is a small rudder visible hanging in the rigging about 1/3 the way down toward the basket. Any photo of a Santos-Dumont in this configuration, i.e., the suspended basket and no keel must be either the No. 1 or the No. 2. See the "visual" for the No. 2, below, for distinguishing features. Santos-Dumont made changes to his design from the No. 1 specifically to compensate for the loss of rigidity of the gas envelope during changes in internal pressure of the hydrogen-filled volume. Unfortunately, his changes were not enough to overcome the weather conditions he encountered on the first flight of the No. 2 on May 11, 1899. That day, the weather was fine when he began preparations for laying out and filling the airship with hydrogen. But in the afternoon, rains came, wetting the envelope, suspension lines, and basket. Trying to avoid loss of the hydrogen, which he has paid for, he opted to ascend. Unfortunately, upon ascending, the changing air temperature caused a loss of hydrogen pressure that none of his countermeasures could compensate for. As the craft descended, unable to maintain its shape, a gust of wind dashed the No. 2 into some trees. The No. 2 was destroyed. 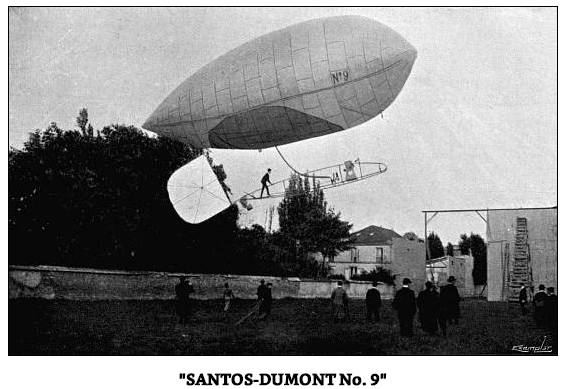 The "Santos-Dumont No. 2", seen here in its only flight as the hydrogen envelope begins to lose its shape due to the hydrogen gas being cooled by a cool and humid atmosphere. Visual: Elongated tube with pointed ends, gondola suspended from cables. No keel as found in later Santos-Dumont airships, all very similar to the No. 1. The No. 2 has a larger rudder than the No. 1 visible now attached at the stern of the envelope. Otherwise the ship is indistinguishable from the No. 1 even though the envelope is slightly larger in diameter. With the short life of the No. 2, Santos-Dumont quickly set out to correct the problem with the loss of rigidity of the hydrogen envelope. The design of the No. 3 included a shorter length but a much larger diameter envelope as well as elimination of a ballonet with which he had had so much trouble. In place of the ballonet, he affixed a 33 foot long (10 m) bamboo pole between the suspension cords and the aeronaut's basket. The design of the No. 3 enabled so much lift that Santos-Dumont opted to use "illuminating gas" (coal gas) instead of hydrogen despite the fact that cola gas has a "lifting power" of only about 1/2 that of hydrogen. Santos-Dumont flew the No. 3 with relative ease, quickly learning its capabilities. So confident he was in the No. 3, he made repeated circles of the Eiffel Tower. Upon landing, he chose a spot very near where his No. 1 was forced down a year earlier. Photo credit (above): http://www.thosemagnificentmen.co.uk/blimps/SD2345.html, Public domain. Visual: "Stubby" tube (only about twice as long as it is wide) with pointed ends, gondola suspended from cables. Bamboo "keel". There is a larger rudder than the No. 1 visible again at the stern of the envelope between the envelope and the bamboo keel. These dramatic design differences make it quite easy to identify photos of the No. 3. The success of the No. 3 led Santos-Dumont to desire his own facility for building and housing his airships. This was most desirable, in part, because now that he could launch and land where he chose, and because his airships lost so little costly hydrogen gas during a flight, it seemed wise to have a hanger in which the fully-inflated airship could be stored between flights. So Santos-Dumont worked with the newly formed Paris "Aéro Club" to secure a location within the Aéro Club grounds at the Côteaux de Longchamps at St Cloud, (Hills of Longchamps at St. Cloud), for his own hangar. He secured construction immediately, and while the hangar was being built he continued to fly the No. 3. On some unknown date, the rudder of the No. 3 came loose and thought he was able to successfully land the craft, it was not repaired. Since he now had his own 100 foot long hangar, his "aerodrome", and his own hydrogen generating plant he decided the No. 3 had served its purpose and began planning the No. 4. Visual: Very pointed, elongated envelope with a keel of a single bamboo beam on which the pilot sat on a bicycle seat. No basket or gondola. Single tractor-propeller, i.e. propeller at the stem. In the surviving photos, few reveal a rudder but the vehicle did have a rudder mounted at the aft-end of the envelope. Santos-Dumont writes that he flew the No. 4 "almost daily" from August through September 1900 from his hangar at St Cloud. Santos-Dumont wanted to display the No. 4 at the World's Fair in Paris which was held from April 14, to November 12, 1900. Upon completion of his work to enlarge the No. 4 he was met with the most foul autumn rains and while waiting for the weather to clear, he collapsed the No. 4 and experimented with improving the engine performance and making changes in the propeller. 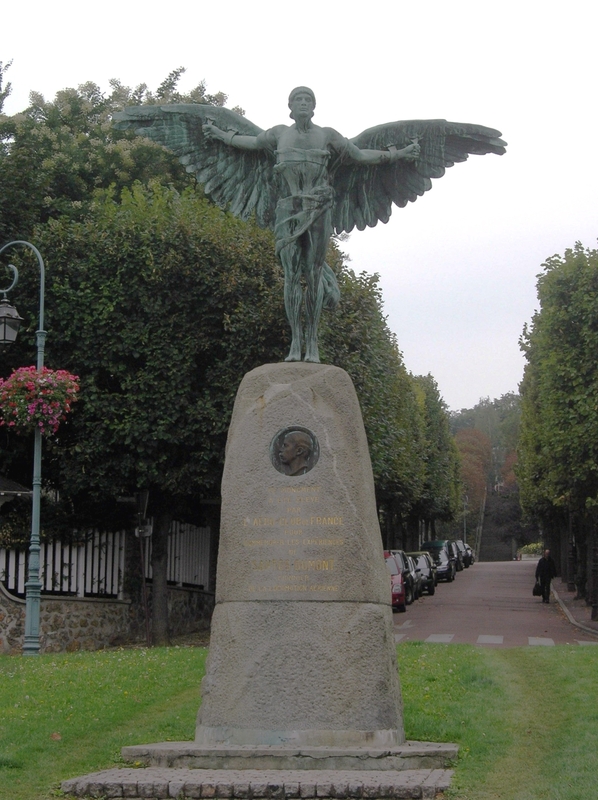 Unfortunately, Santos-Dumont fell ill to pneumonia and was forced to flee Paris for Nice to recuperate. At Nice, he worked on a new form of a keel made of a light-weight triangular frame of pine. There, he invented the well-known triangular keel we see in photos of many airships of the early 1900's. His first use of the new keel design was in the No. 5. Visual: Reused the No. 4's enlarged, elongated envelope with very pointed ends. A nearly equilateral triangular rudder suspended between the envelope and the keel. A full, triangular-framed keel, the first time used. The engine mounted on the keep is an air cooled engine, so there is no radiator. There is nothing mounted on the keel above the top rail, that is, the fuel tank is "in-line" with the top rail of the keel. The pilot's basket is located in the 4th "cell" back from the front of the keel. 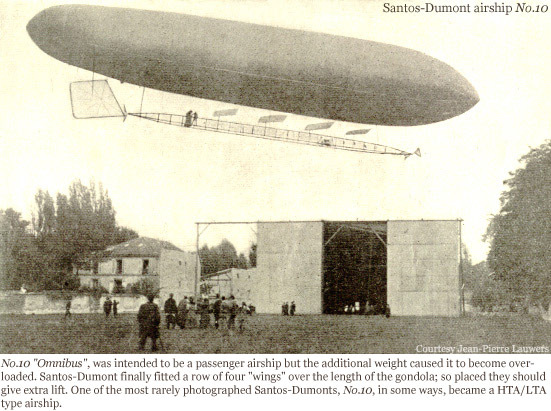 Santos-Dumont began his No. 6 immediately after the No. 5 crashed. The No. 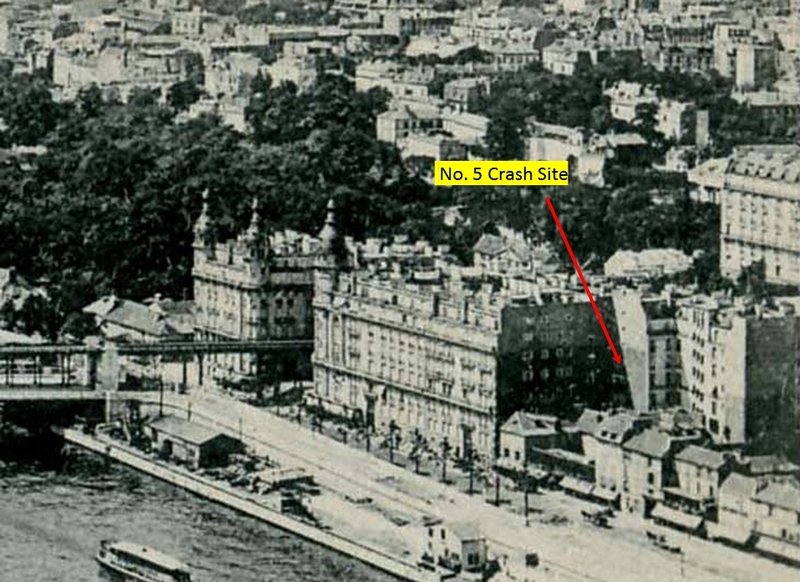 6 was completed just 22 days after the 8 Aug 1901 crash of the No. 5. 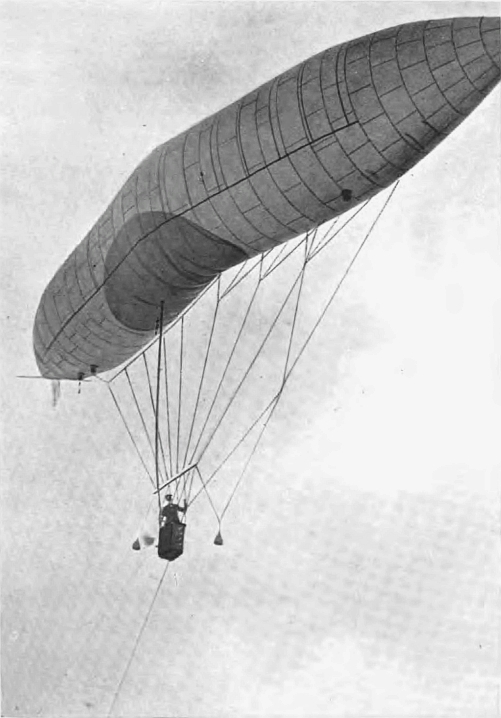 Having suffered mechanical failure in his other airships, he paid special attention to the gas valves for both the hydrogen-filled main envelope and the air-filled ballonet. During the course of testing the No. 6 between early September and the 19th of October he had at least two accidents.Santos-Dumont did not record in his book the situation or cause of the accident of 6 September, 1901, but he says it crashed into trees on 15 September, 1901 due to making too sudden a turn. Nevertheless, the No. 6 was ready on 19 October, 1901 for his attempt at the Deutsch Prize, which he won. Visual: The No 6. is not as "pointed" as the No. 5. The No 6. has end caps on both the stem and stern of the envelope while the No 5. had no end caps. The pilot's basket sits in the 3rd "cell" of the keel while in the No. 5, the pilot's basket was positioned in the 4th cell. There is a visible radiator, midway along the keel, mounted above the keel. The No. 5 had no radiator. In photos of the No. 6 prior to 19 Oct, 1901, the No. 6 had a triangular rudder similar to the No. 5 making photo identification difficult. But by 19 October, the rudder was a semi-circular version. Also, the "dark oval" of the ballonet at the bottom of the envelope of the No. 6 was centered on the envelope, only slightly forward of the center of the keel while in the No.5, the oval of the ballonet was noticeably aft of the center of the keel. 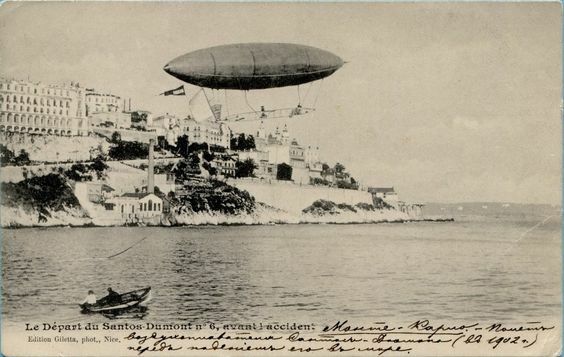 After winning the Deutsch Prize, Santos-Dumont accepted an invitation from the Prince of Monaco to spend some time in Monaco where he could fly unfettered over the Mediterranean. 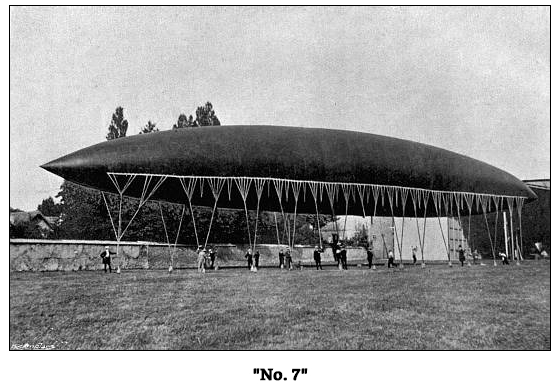 To sweeten the deal, the Prince would build Santos-Dumont an airship shed on the beach of La Condamine. 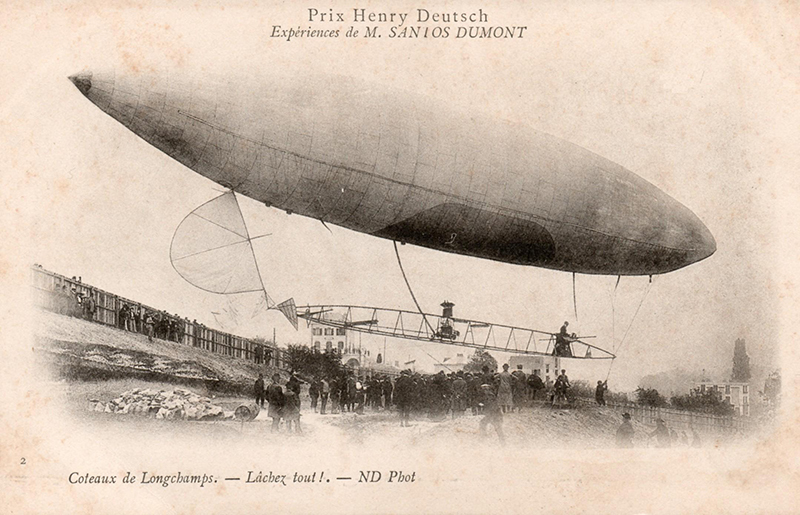 Santos-Dumont accepted the offer and transported himself and his No. 6 to Monaco in January 1902. At Monaco, the Prince had constructed Santos-Dumont an enormous shed for his airship, complete with doors which Santos-Dumont loved so much for his hangars. Though flying the No. 6 to and from the hangar at La Condamine was fraught with perils, Santos-Dumont accomplished what might very well be an unprecedented and unreplicated feat. On the morning of January 29th, 1902, Santos-Dumont returned to the hangar after having completed his first voyage out into the Mediterranean. Upon returning, he found the conditions ideal, no wind. After crossing the sea wall between the ocean and his hangar, he cut the engine of the No. 6, and literally "flew" the airship into the hangar without aid from the helpers below! This may well be the only recorded time in history when an airship pilot flew his airship directly into the hangar. Santos-Dumont admits in his book this was not a particularly wise thing to do, and conceded he should not be so bold as to ever try it again! Santos-Dumont continued to test his No. 6 at Monaco into February, 1902. Unfortunately, on February 14th, he met with disaster. The No. 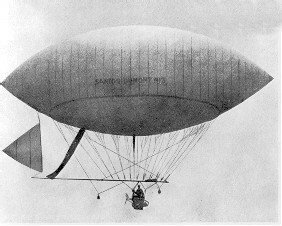 6 had departed the hangar improperly inflated and configured for flight - a condition Santos-Dumont attributes to the poor conditions near his hangar at Monaco which did not permit his ascending into the higher atmosphere before he flew out into the Mediterranean where the changing temperatures in the sun, above the water produced dramatic pressure differences in the envelope. The airship began to point up, stem first, higher and higher beyond design limits. Some of the rigging wires became entangled in the propeller and Santos-Dumont was forced to shut of the engine. At that point his only choice was to release hydrogen for a controlled decent to the ocean surface, where it was damaged but recovered. The No. 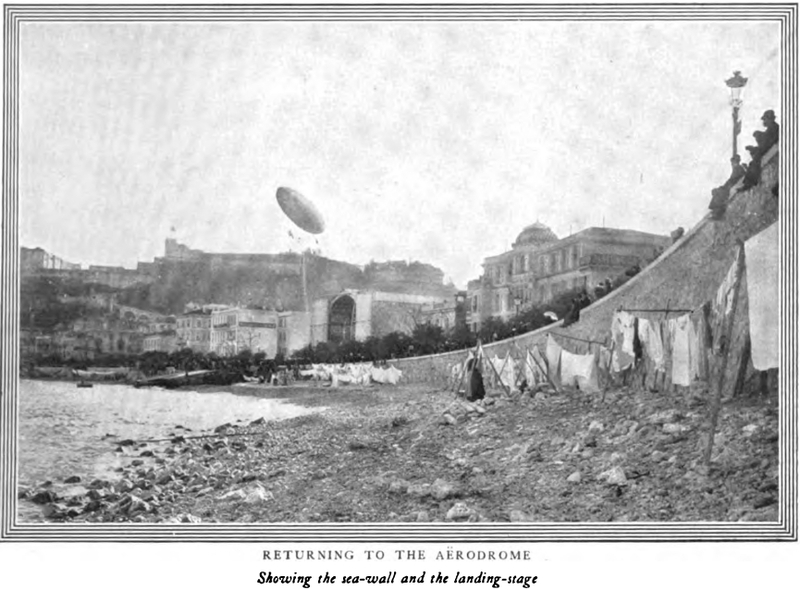 6 descending into the Mediterranean on its last flight, February 14th, 1902. A bit of mystery surrounds the ultimate fate of the No. 6. Santos-Dumont says in his book, page 256, that the flight in Monaco, 14 February, 1902 was its last voyage - the implication being that the No. 6 never flew again. And on page 258, he states the "Balloon, keel, and motor were successfully fished up the next day and shipped off to Paris for repairs." But on page 318 he says that the envelope of the No. 6 was retrieved from the bay of Monaco and sent to London for inflation and display at an exhibition at the Crystal Palace. No mention is made about the No. 6 being sold to anyone. Paul Hoffman in "Wings of Madness", page 196, when Santos-Dumont had returned to Europe from an April, 1902 visit to America says: "He [Santos-Dumont] revealed that he had sold the No. 6, which was being repaired in London, to the Brooklyn Rapid Transit Company". 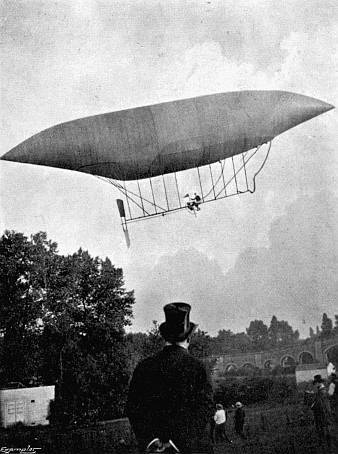 Paul Hoffman records that Santos-Dumont travelled to London in late May, 1902 to inspect the progress of the restoration of the No. 6, the envelope of the airship was found slashed when workers were preparing to reassemble the craft in a new shed built next to the Crystal Palace. A new envelope was made for the No. 6 and the entire airship was shipped to New York in July. Though Santos-Dumont returned to New York that summer and inspected the resurrected No. 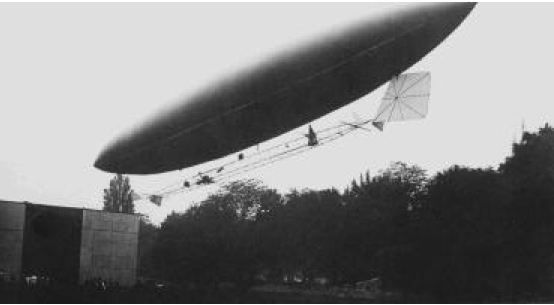 6, several accidents to the airship occurred and that, combined with Santos-Dumont's disgust with the progress of his arrangements to fly his airship in America, Santos-Dumont quietly returned to Europe refusing any further dealings with his American contacts. But the mystery deepens because there are many articles and newspaper stories in the fall of 1902 which describe the No. 6 being flown in New York by Mr. Edward C. Boyce (sometimes spelled "Boice") and that the airship had been at Brighton Beach "all summer"! An entry in the 1902 "Annual Cyclopaedia and Register of Important Events of the Year", page 5, after discussing the accident with the No. 6 while in Monaco, says: "This balloon, No. 6, with some slight alterations, was brought to the United States in July, 1902, and was used at Brighton Beach by Mr. Edward C Boice in his ascent on Sept. 30, 1902." Following that race in September, 1902 I have as yet not found evidence of exactly what ultimately became of the Santos-Dumont No. 6. The No. 7 has a bit of a sordid history. Few details are found on when the airship was designed and built. Few pictures of the No. 7 are found. Most surviving photos show only the No. 7's inflated envelope. The exact date the No. 7 was shipped to St. Louis, USA for the 1904 exposition is unclear. The record of just what happened to the No. 7 after it arrived in St. Louis is not clear. All we actually know is that sometime after arrival in the US, and preparation for the exposition, the No. 7's envelope was found in its shipping crate slashed in four locations. It had been inspected upon arrival and found in good shape so the envelope was destroyed sometime after arrival in St. Louis. The No. 7 was destroyed for reasons which remain unclear to this day, though sabotage is assumed. This popular, undated photo (probably late March, 1904) shows the inflated envelope of the No.7 held down by sandbags in a static test. No keel, engine, propellers, rudder, or pilot's basket are seen. This is the only photo I was able to find of the No. 7 in flight test. The shot shows the No. 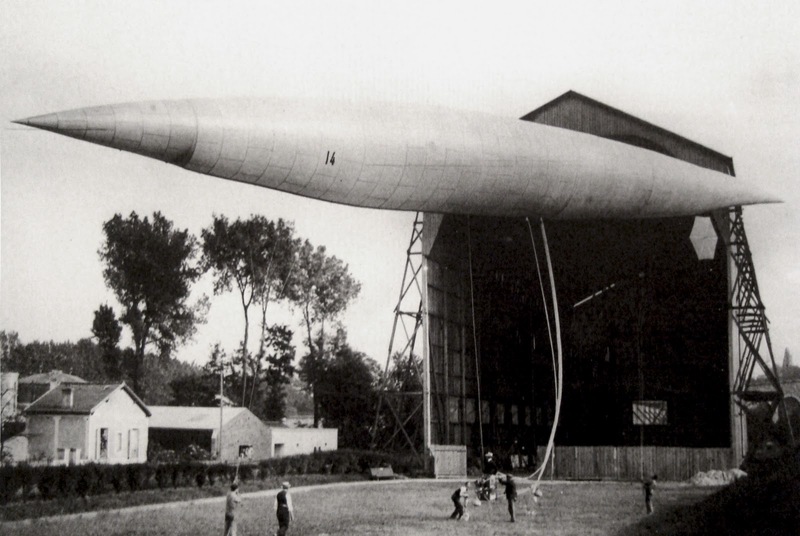 7 at Santos-Dumont's hanger at Neuilly-St. James and is dated to between 16 May, 1904 and the 1st part of June. The No. 7 was shipped to St. Louis on the 9th of June. Operating dates: (Design began in 1902, construction in May, 1903). Operational tests from 16 May, 1904 to the end of May. No further testing is known. The No. 7 was shipped in early June, 1904 to St. Louis, USA, and the envelope was destroyed, reportedly by sabotage, shortly after it arrived. 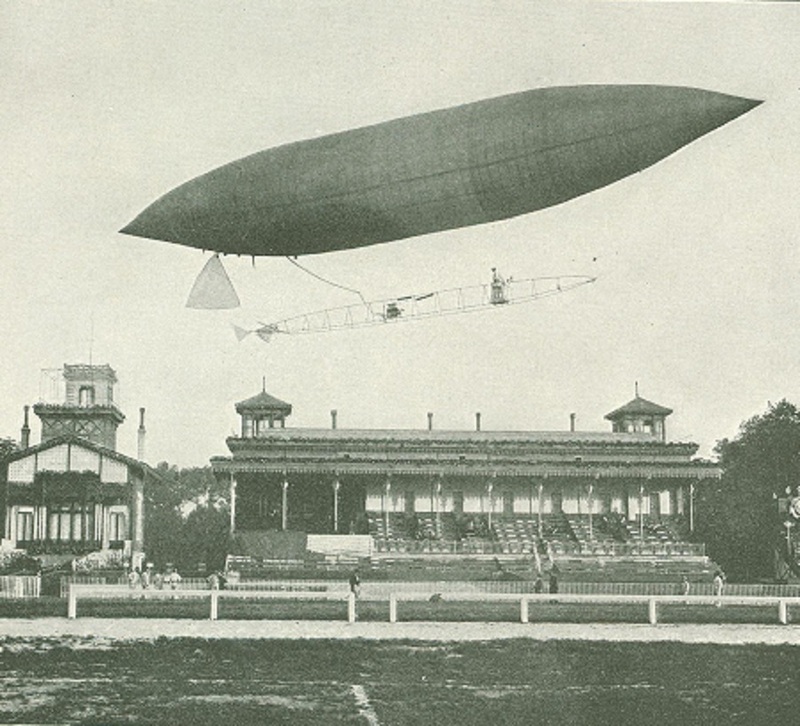 The airship had been shipped to St. Louis for display and racing at the Louisiana Purchase Exposition of 1904. Visual: Few pictures exist of the flight-ready No. 7. At 160 feet long, its keel measured approximately 90 feet long. The pilot's basket sat in the aft, far from the engine instead of forward where it usually was positioned. The pilot was about 42 feet from the engine! The No. 7 had two propellers, one at the stem and one at the stern. The rudder was a large rectangle attached at an oblique angle at the hinge. The June 18th, 1904 Scientific American confirms that Santos-Dumont built a "No. 8" and sold it to a "Mr. Boyce" of New York. The article says (while discussing Boyce's purchase that year of the No. 9): "Mr. Boyce had previously purchased the No. 8, but had an accident with it during his first ascensions." A statement by Luiz Pagano in a May, 2011 posting on Blemya.com about the inventions of Santos-Dumont says the No. 8 was an exact duplicate of the No. 6, also confirming that it was destroyed in New York on its first flight. As briefly mentioned above, print evidence also seems to indicate that Edward Boyce also purchased the Santos-Dumont No. 9, though Santos-Dumont mentions no such fate of the No. 9 in his book. A 2012 post on the "aerodrome.com" (http://www.theaerodrome.com/forum/showthread.php?t=56141) website says "In 1904 S-D brought the No. 9, along with the No. 7 'Racer' to the US. The No. 7 continued onto St. Louis while the No. 9 stayed in New York where it was exhibited at Dreamland amusement park at Coney Island. Edward C. Boyce, the amusement park tycoon and part owner of Dreamland, soon after bought the Baladeuce as he had the Santos-Dumont No. 6 a couple of years earlier." Page 24 of the "Report of the National Museum, 1907" states: "The Santos-Dumont airship No. 9, was presented to the Museum by Mr. Edward C. Boyce, of New York." The No. 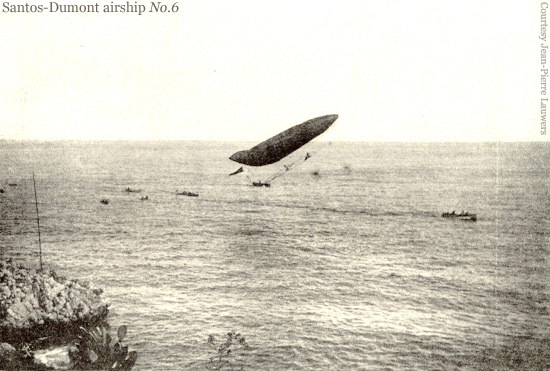 9 may very well be unique in airship history. Though many small airships have been built, the No. 9 of Santos-Dumont may be the only airship in history to have been built, in his own words: "for my pleasure and convenience only." He literally built the No. 9 to kill time waiting for a worthy competitor to bring forth an airship to compete against him! The No. 9 appeared in two configurations. In the 1st version, the envelope held 7770 cubit feet of hydrogen permitting only 66 pounds of ballast. After a few weeks of testing he enlarged the envelope of the No. 9 by nearly 20%, permitting 132 pound of ballast. This became the 2nd version seen in most photos of the No. 9. The No. 9 at Neuilly-St. James. The No. 9 proved to be a remarkable airship of enormous maneuverability. 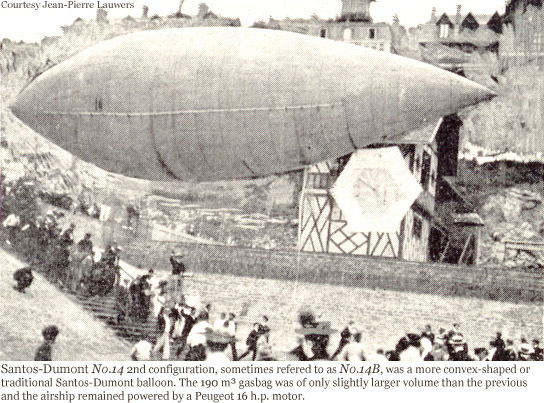 Santos-Dumont could fly it "at-will" even landing on busy streets in front of Paris pubs! The No. 9 is also known as "La Balladeusse". This photo is one of several well-known photos of the No. 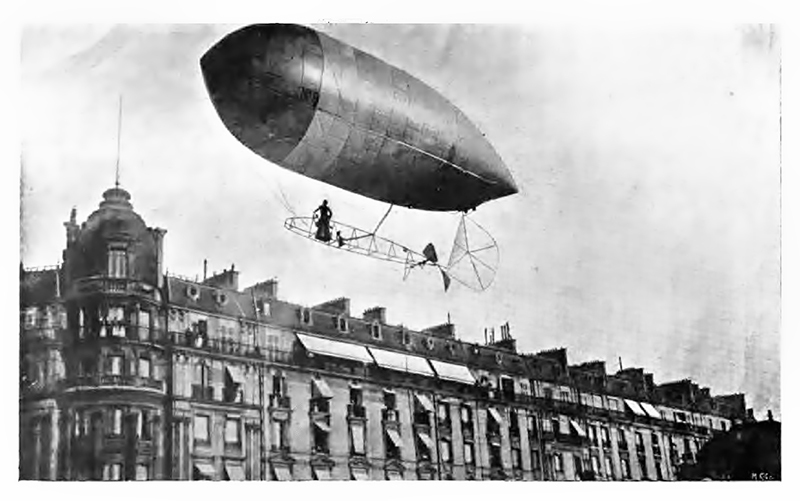 9 landing in Paris on one of Santos-Dumont's many pleasure trips in his "runabout". It is most often assumed to be in front of his apartment building along the Champs-Élysées. It is not! After rather intensive study, I identified the precise location of this photo - see "Sites of Interest" below. Visual: Stubby nose, pointed tail, short keel, pilot's basket forward of the engine very close to the stem. Large, semi-circular rudder. The No. 10, the "Omnibus", was an ambitious project. It was intended to be a passenger-carrying craft capable of carrying 10-12 people. In addition to the long keel carrying the engine, propeller, rudder and pilot, there was to be a second keel suspended below it in which passengers would ride in 3 baskets - up to four people per basket. Clear in photos of the No. 10, Santos-Dumont had begun to consider airplane flight. Mounted above the keel, between the envelope and the keel were 4 "wings". Presumably, during forward motion, these "wings" would provide some small lift to the craft permitting the airship to ascend even if it was not fully buoyant but was slightly heavier than air. Here the No. 10 is seen in one of the rare photos of the craft. It was taken on 19 October, 1903 - two years to the day after Santos-Dumont's successful flight in the No. 6 which won the Deutsch Prise in 1901. 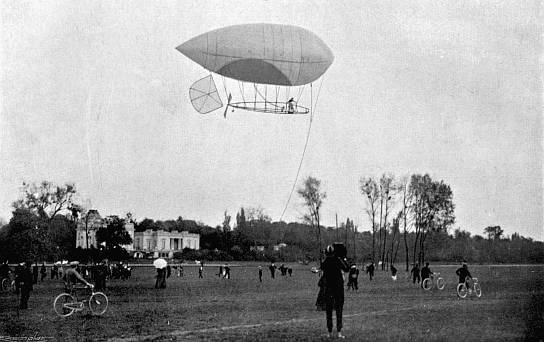 It is being tested at Santos-Dumont's grounds at Neuilly-St. James. In the background is Santo-Dumont's large hangar in which he could house more than one airship. Just as there are few photos of the No. 10, indicative that there were few test flights, there is no evidence that Santos-Dumont ever flew the No. 10 with the passenger keel or with passengers. Visual: Very long and rounded envelope with a very long keel. Pilot's basket toward the aft, engine forward. Propeller on the keel at both stem and stern. A large trapezoidal rudder. A set of four horizontal stabilizers, "wings", were positioned along and above the keel. Easily distinguished from the No. 6 by the longer keel and envelope with the ends of the envelope more rounded than the No. 6. The No. 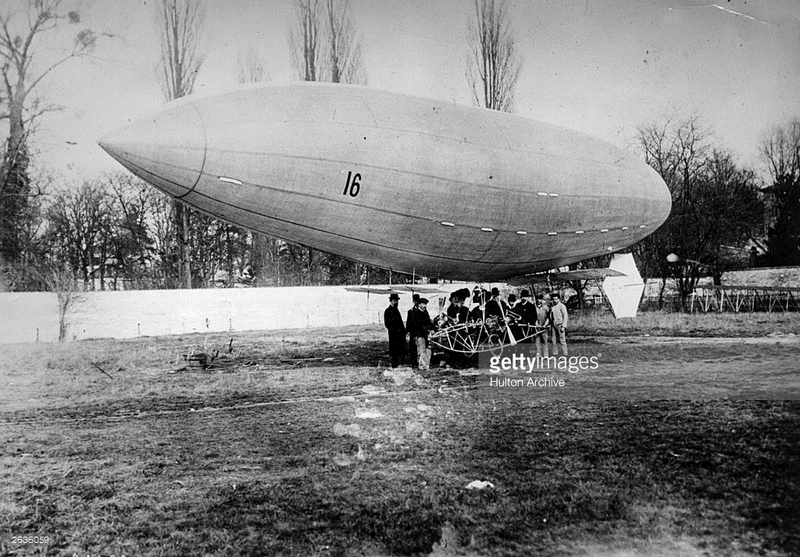 11 was not an airship, rather it was an experiment in aeroplanes. The No. 12 was not an airship, rather it was an experiment in helicopters. Photos exist of the the No. 12 in the shed, but it was never completed. The No. 13 was an odd balloon. 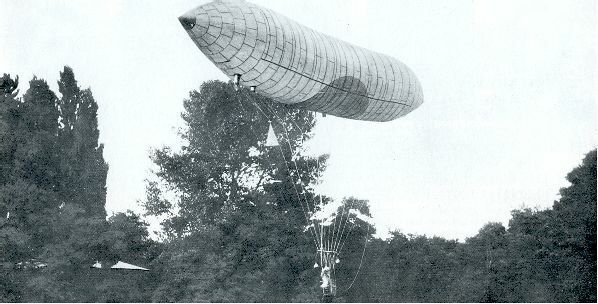 Intended as a "hybrid" hydrogen-filled balloon with a lower envelope for conventional hot air, the craft was built but never completed. Probably a good thing! Not much is found on the No. 14. Even why Santos-Dumont built the No. 14 is not well understood. What is known is that he designed the airship in Paris but spirited the craft to the shores of Trouville beach on the English Channel where he was pleased with its performance. Some time after testing the No. 14, Santos-Dumont met up with a Mr. Gabriel Voisin, and the two of them began designing an aeroplane. The airship No 14 was redesigned such that the envelope was shortened and widened and photos of the era show the No. 14 was tested again in this new, 2nd configuration. In July 1906, the gondola of the No. 14 was removed and in its place an aeroplane was suspended. The No. 14 airship had become a "tug" of sorts. Using the No. 14, Santos-Dumont tested the air-worthiness of his aeroplane, the 14-bis ("14-encore"). The No. 14 in its initial configuration, with its very long, narrow envelope, and very small pilots' basket/gondola. The No. 14 in its 2nd configuration with a noticeably shortened, and larger diameter. Visual: In its initial configuration, a stunning, long, extremely pointed envelope with a small gondola hung quite a distance from the gas-bag. No long "keel" as Santos-Dumont had been using. Pilot's basket, engine and propeller very much like the No. 1, though the frame surrounding the basket was like a shortened No. 9. In its second configuration, the same gondola, with a shortened and fatter envelope. Both configurations used a hexagonal-shaped rudder. The No. 15 was an unsuccessful biplane. The No. 16 was a curious hybrid. It was a small airship, combined with a framework hanging below of a sort of aeroplane framework consisting of lifting surfaces (wings), a rudder, an engine and wheels. It did not survive its first test flight though reports vary from "it fell apart on the ground" to "stranded on a tree while landing after her first ascent." One of the few photos/post cards of the No. 16. Even if enhanced by an artist, you can see the key features of the No. 16 and its interesting diversion from the established Santos-Dumont designs. Visual: Widely deviant from all other Santos-Dumont airships. Small, pointed envelope with a short keep supporting an engine and pilot's basket and lifting surfaces clearly for an airplane. A hexagonal rudder. "No. 9 near the Château de Bagatelle"
Among the many photos of Santos-Dumont airships, many have identifiable buildings in the background which still survive today. A good example is the Château de Bagatelle, where multiple photos of the No. 9 reveal the Château in the picture. This location was, of course, easy to find! On the 8th of August, 1901, Santos-Dumont had what he described as a "terrible day". On a trip to the Eiffel Tower in his No. 5, he began losing hydrogen. As he was attempting to win the Deutsch Prize, he made a bad decision to press-on. Enough gas was lost that suspension wires became caught in the propeller and he had to cut-off the motor. He had already rounded the Eiffel, but was descending uncontrolled. 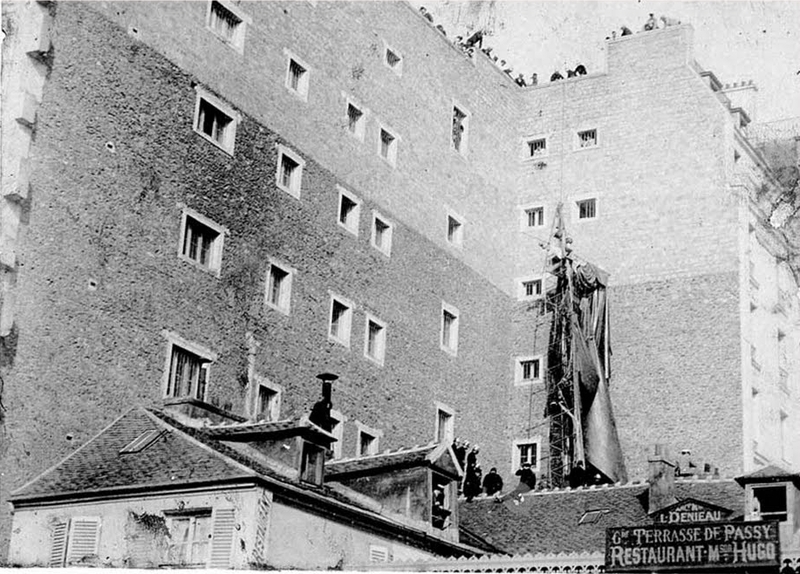 The winds blew him backward and he crashed into the Trocadero hotel complex. The No. 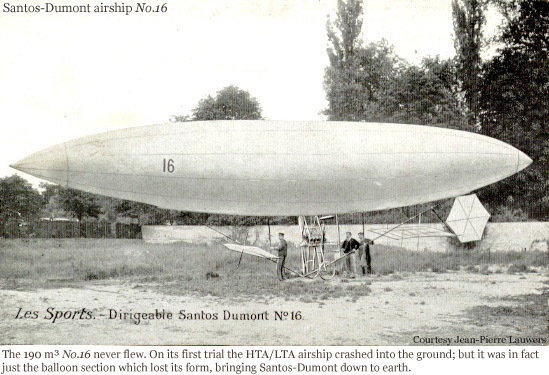 5 was destroyed but Santos-Dumont survived with only minor injuries and a bruised ego. 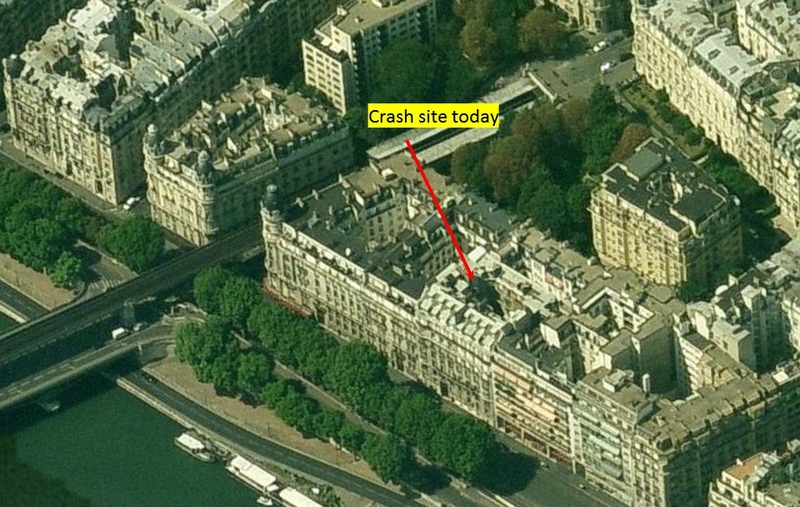 There is no doubt that this is the crash site. There are many features in the photo above which match the No. 5 crash photo. The St. Cloud suburb of Paris, France in the late 1800's became a flying field for the balloons of the era. 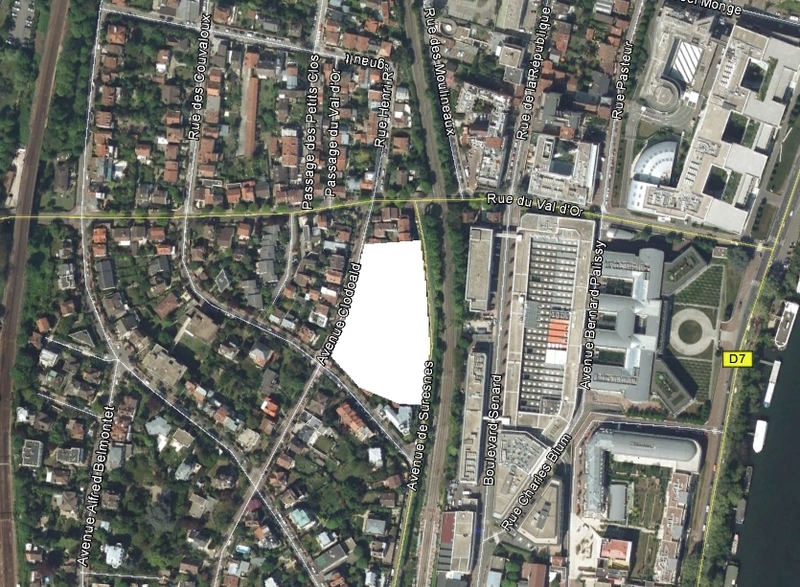 The Aéro-Club Français secured a large plot of land in St. Cloud and made it their "aerodrome". 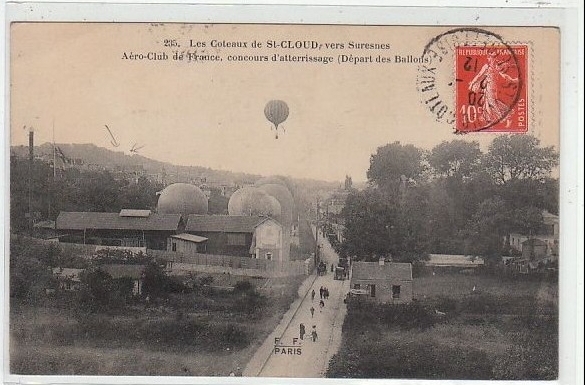 One of the early photos I investigated was a long-range shot of several gas-filled spherical balloons clustered on the ground at this "Aéro Club de France". This was the first photo I encountered of the flying field at St. Cloud so I spent time locating it. 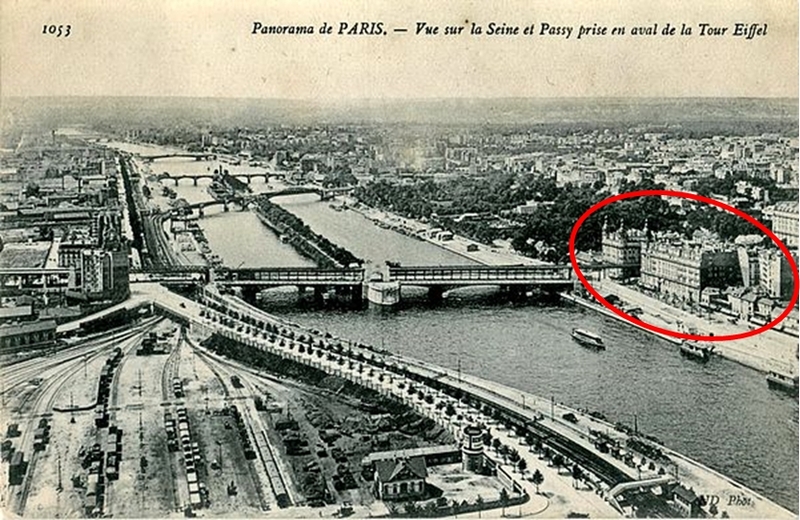 This photo, and its location, allowed me to investigate further the area of St Cloud, Paris, France which was so important to the history of Alberto Santos-Dumont. I base this estimate of the location here because a late 1870 plat map of the area indicates a large, flat, open area in this spot. 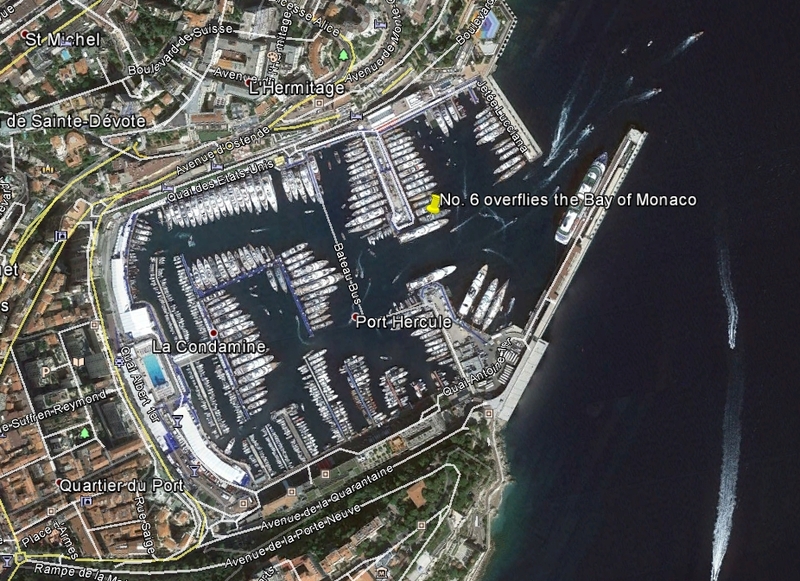 It's the logical place where the Prince Prince of Monaco would build a hangar for Santos-Dumont! 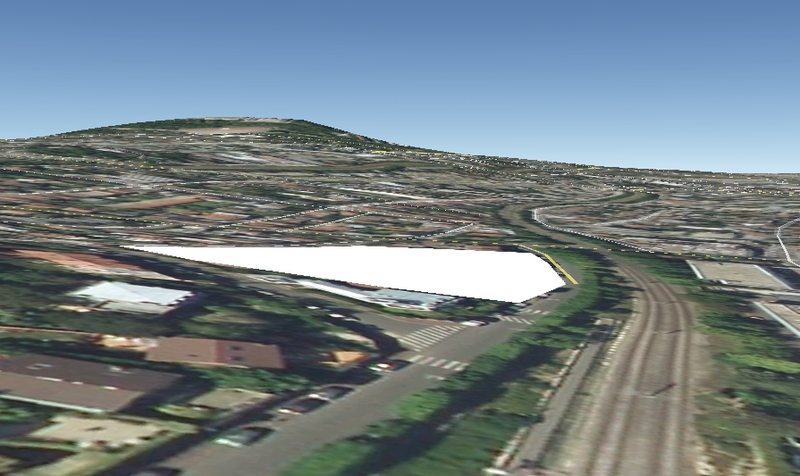 It's at (Lat Lon) 43.735013 007.421000. On the 19th of October, 1913 Alberto Santos-Dumont himself was present at the unveiling of a statue to commemorate his contributions. It was 12 years to the day after his record flight in his airship No. 6 around the Eiffel Tower winning the Deutsch Prize. Santos-Dumont reluctantly spoke to the gathered crowd and was photographed standing next to the statue. Today, the statue stands in the same location though it is but a facsimile of the original. The original was removed and destroyed during the German occupation of France in WW II. (A careful study of the present-day statue reveals that the bronze of Icarus is not the same casting as seen in the original display). Above, the Santos-Dumont statue, the original display, October 19, 1913, St. Cloud France. 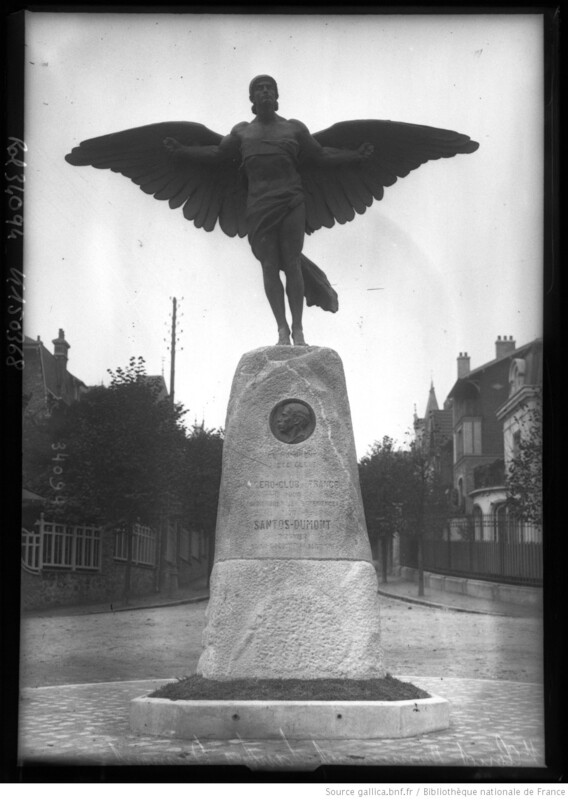 The inscription says: "Ce monument à été élevé par l'aéro-club de France pour commémorer les expériences de SANTOS DUMONT pionnier de la locomotion aérienne", [This monument was erected by the aero-club of France to commemorate the experiments of SANTOS DUMONT pioneer of aerial locomotion].